SERDANG, Sept 13 - Universiti Putra Malaysia (UPM) launched the Gigpreneur Entrepreneurship Competency Enhancement programme through the Guided Action Coaching initiative to instil elements of entrepreneurship education in schools. Deputy Vice-Chancellor (Student Affairs and Alumni), Prof. Dr. Mohd Roslan Sulaiman, said the programme that brought together expertise from the Institute for Agricultural and Food Policy Studies (UPDM), UPM, Faculty of Economics and Management (FEP) and University Community Transformation Center (UCTC) was inspired based on a research conducted by a UPM research group. "The programme which is under the purview of the UPM Knowledge Transfer Programme is able to stimulate teachers and students to continue practising teaching styles and autonomous learning without compulsion and external assistance," he said. He said the initiative was one of the ways for the university to channel knowledge to the community. "The university is aware that excellence in research should also be expanded to develop the society towards achieving sustainable development as well as in keeping up with the latest trend in the global educational challenges," he said. The entrepreneurship education project which began on April 4 was led by Assoc. Prof. Dr. Sridar Ramachandran and involved 36 Form 4 students and six teachers from Sekolah Menengah Kebangsaan Bandar Banting (SMKBB). Apart from UPM and the school, the programme also received various supports from the corporate sector, including World Institute for Action Learning and ComPas MTC Malaysia. Students participating in the programme went through eight phases of self-study (heutagogy) or coaching with an aim of mastering the minds of entrepreneurship instead of the pedagogical or teaching method for six months. 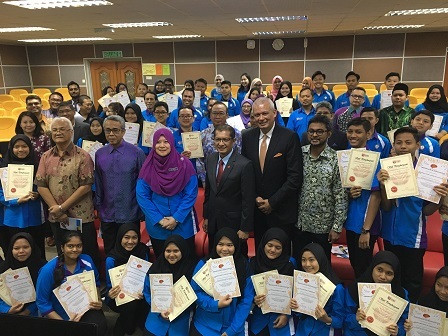 Within six months of its implementation, the programme has yielded positive inputs among the students through the Guided Action Coaching method inspired by Datuk Indera Ridzwan Abdullah. Datuk Indera Ridzwan Abdullah also inspired the term 'Gigpreneur' in the programme to inspire generation Z so that they develop a resistance towards the world of VUCA (Volatile, Uncertain, Complex, Ambiguous). SMKBB Principal, Siti Asnah Ahmad, said the initiative was a success and had formed a line of leadership among the students. "Today, we witness success from one angle, that is in developing entrepreneurship skills amongst students; however, what is more to be proud of is to have students with confidence," she said. SMKBB student, NurSyahirah Abdul Ghani, 16, said the programme has given her the exposure and new knowledge on entrepreneurship.